All transactions are safe and secure with a reliable history in online purchasing behind each of our associates. 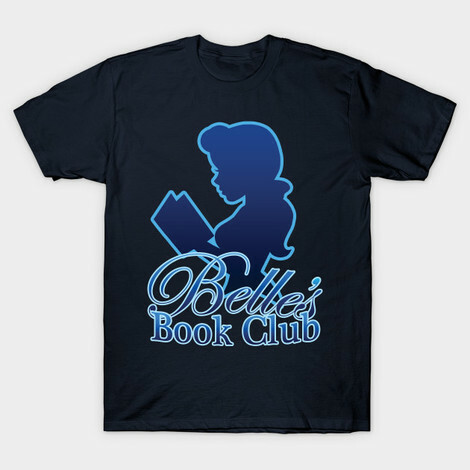 Buy the Belle's Book Club Shirt to own Beauty and the Beast clothing and merchandise. Belle's village is comprised of many interesting characters, including herself, her father Maurice, Gaston, LaFou, Laurette, Paulette and Claudette, among others. This Beauty and the Beast Belle t-shirt for adults lets everyone know that you're not only a member of the village too, you're part of Belle's Book Club. No, this doesn't mean you have to stroll through the village with your head in a book all day, but you wouldn't look out of place if you did. However, it would only be a matter of time before you stepped in horse droppings or walked in front of a wagon. In addition to the Belle's Book Club Shirt above, browse the Beauty and the Beast Clothing Gallery for more apparel like men's and women's clothes, kids shirts or hoodies.